Sharing a long tradition of positive relations, the United States of America and Norway today reaffirmed commitment in working together in advancing global peace and security. In his remarks with Norwegian Minister of Foreign Affairs Espen Barth Eide after their meeting in Washington DC, US Secretary of State John Kerry says as allies in NATO, Norway and the United States work very closely together to advance peace and security from Afghanistan to Kosovo to Libya and beyond, to Sudan and elsewhere. According to Secretary Kerry, Norway is helping to drive global efforts with respect to peace in the Middle East. 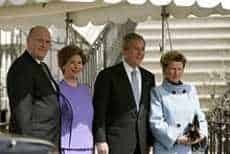 Harald V of Norway and Queen Sonja of Norway, greeted by Laura and George W. Bush at the White House during the March 2005 State Visit to the U.S. He says Norway really played an oversized role in creating that great moment of the handshake here in Washington, and everybody is not without a sense of responsibility for the fact that we are still talking about some of the very same issues. Secretary Kerry also says Norway has a particular interest in seeing the United States and the Palestinians and the Israelis come together in a legitimate process, and we talked about that. According to Secretary Kerry, Norway has contributed roughly $75 million to humanitarian relief in Syria since 2011. And together, Norway and the United States are supporting Syrian refugee efforts, civilians, even as we continue to try to pressure the Assad regime into coming to the negotiating table to have a negotiated transitional government, Secretary Kerry said. After their meeting, Foreign Minister Eide says US and Norway work closely with the Syrian opposition. Both countries have provided humanitarian aid, and both countries also now working and trying to help them to set up local council inside Syria, and more and more assistance is happening on the inside. Foreign Minister underscores both countries are very clear, President Assad has lost all credibility, he must go. In addition, Secretary Kerry says it is inevitable and true of every single opposition in any kind of circumstance like this that there are tensions and differences of opinion as they find their footing, and there’s no surprise in that. Secretary Kerry says they have to work quietly and effectively with the international community. He adds there are lots of people involved and engaged with the Syrian opposition. 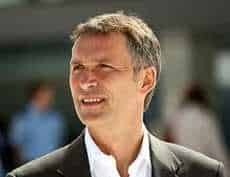 Jens Stoltenberg, the Prime Minister of Norway since 2005. He emphasizes that the cause is the cause of the Syrian people. Secretary Kerry cites the Syrian opposition has committed themselves to a broad-based government that is going to represent all of the people of Syria, even as there may be some dissension as to tactics or process among them. Both US and Norway want to be able to see Assad and the Syrian opposition come to the table for the creation of a transitional government according to the framework that was created in Geneva, the Geneva Protocol, which requires mutual consent on both sides to the formation of that transitional government. That’s what we’re pushing for. And to do that, Secretary Kerry points out that President Assad must change his calculation so he doesn’t believe he can shoot it out endlessly. However, Syria needs a cooperative Syrian opposition to come to the table, too, Secretary Kerry noted. According to Secretary Kerry, both countries discussed their shared mission in Afghanistan. Secretary Kerry says Norway has been a staunch ally in Afghanistan and has contributed more than generously to the efforts to develop Afghanistan and to try to bring about regional reconciliation. He adds since 2002, Norway has contributed roughly $1 billion in civilian assistance to help the Afghan people chart their road to the future. Secretary Kerry says he can’t think of two countries which work in greater combination with greater agreement on more issues of importance to global peace and security than the United States and Norway. When it comes to crosscutting issues like climate change, Norway is a trusted partner of first resort, Secretary Kerry highlighted. He says it’s safe to say that Norway is one of the great global citizens and US is appreciative for its relationship and for their shared interests. Norway and the United States have enjoyed a longstanding friendship based on shared democratic values. Both countries are working together to solve some of the biggest challenges around the world. From helping to build a stable and secure Afghanistan, to addressing global health issues and increasing cooperation in the Arctic, the world is safer and more prosperous because of their efforts. The United States and Norway have a long tradition of positive relations. The friendly relationship between two countries was reinforced when King Harald V of Norway hosted the visit of U.S. President Bill Clinton in November 1999, the first visit to Norway by a U.S. President in Office. Both countries are expanding on the success of NATO in securing transatlantic security and helping the Baltic nations to find their place in the new Europe.